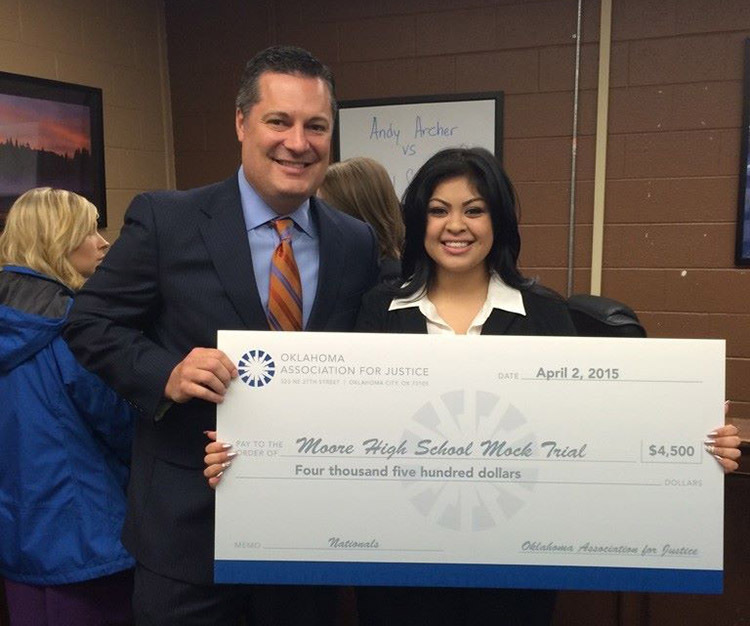 McIntyre Law Helps High School Mock Trial Team - McIntyre Law P.C. A “mock trial” is exactly as it sounds – it’s a competition in which students act as attorneys, witnesses and other courtroom figures to simulate how a case would be tried in a real court of law. 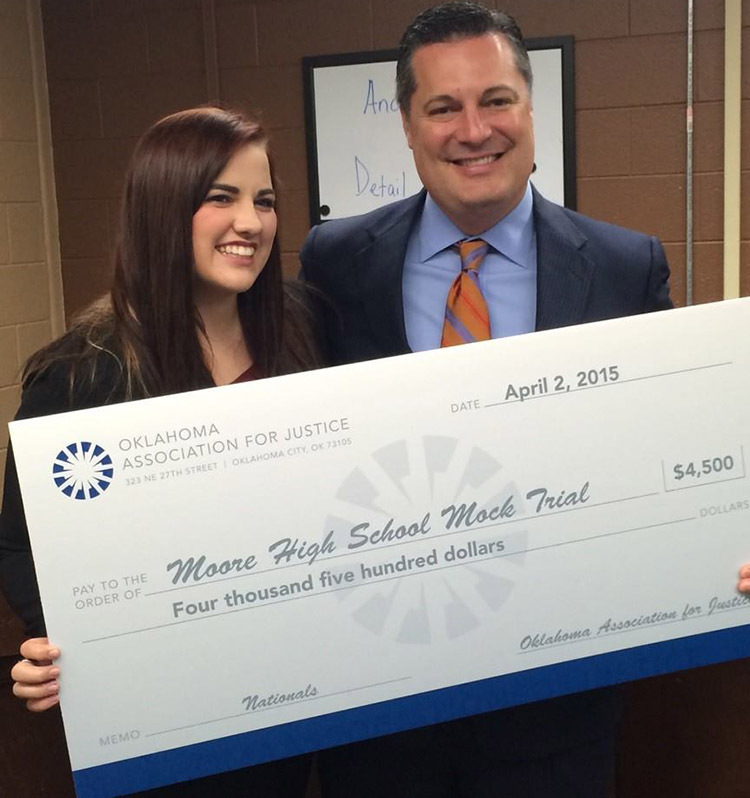 The 2015 National High School Mock Trial Championships are taking place next month, and the Moore students were ready to go, except for one thing… the $10,000 it would take for the team to attend. 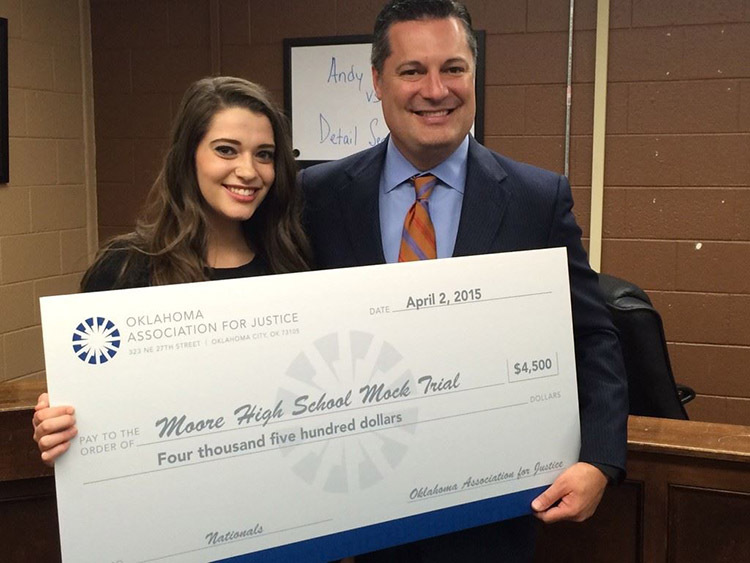 That’s why the Oklahoma Association for Justice, headed by President Noble McIntyre, decided to present these students with the funds they needed to make the trip a reality. Student Randi Mattox said that, “Mock trial teaches public speaking, critical thinking, teamwork. It teaches a lot of important tools that we can use with whatever career we choose.” Beverly Ferree, teacher in charge of the mock trial program, is proud of the work these students have done and says that they are worthy competitors for any team in the country, but they couldn’t afford the $10,000 to make the trip. For many, the hours outside of school are spent working to put food on the table for their families. But, with the kind of training and experience this will provide, they could be on the road to great success in the years after they finish high school. By providing the funds necessary to make this trip, McIntyre and his colleagues are giving each one of these students a chance to shine – which could lead to opportunities and scholarships that might not have been possible otherwise. And, these teenagers could very well become the next leaders of the Oklahoma legal community… they could be McIntyre’s future colleagues or opponents. Maybe this time, saying “I’ll see you in court,” is not such a bad thing!